She has released her debut EP Shaken in April 2014 to critical and commercial acclaim, as well as her second EP The Lions Eyes in 2015 to even higher praise. Yep, we are indeed talking about Becca Bradley, who has now revealed her full length debut album today; which was funded a couple of years ago via kickstarter. Becca Bradley isn’t yet a household name, but from these impacting and hopeful eleven tracks, I am certain that she will be. 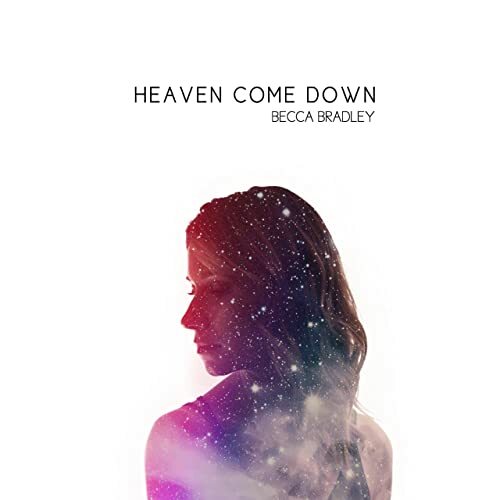 As Becca has shared the stage with many high profile artists such as Kelly Clarkson, Keith Urban, Lady Antebellum, Rascal Flatts, Amy Grant, Taylor Swift, and Michael W. Smith, as well as touring extensively with Francesca Battistelli in 2014 as a backing vocalist and cellist; Becca’s new album Heaven Come Down is sure to inspire and encourage. Having release over half the album last year and the year before as singles and promotional singles, Becca’s new project features only 5 more never-before-heard songs, and some of us may feel a bit cheated by this album, and may feel it’s not inventive enough. However for those of us who are excited and who haven’t heard her singles from last year, this album will please you very much. Maybe for everyone else too! As Becca draws us closer to Jesus and worships Him with her honest and emotional voice similar to Kari Jobe and Leigh Nash of Sixpence None The Richer, we are immediately presented with the title track as the album opener. Unveiling a debut full length album independently is quite bold, yet there is something about Becca’s more recent songs that makes her music compelling to hear and to connect and engage with. “Heaven Come Down”, a synth driven EDM infused pop tune, is a stirring, emotional and poignant call to God, asking God to come down to earth, right here and right now- Becca passionately asking God to reveal his presence and send revival to this Earth in this moment, particularly in this political climate globally. Though not explicitly listing everything that’s wrong with this earth that Jesus can and will obviously fix in His timing, Becca’s fervent plea should echo inside each of us also, as we actively seek God’s presence, and each do our bit in order for this world to reflect the love of Jesus while we are waiting for Jesus to come back. “Nothing Short Of A Miracle” follows, and is a pop radio friendly tune that channels Becca’s Ginny Owens and Laura Story vocally, as she earnestly reminds us that because of everything Jesus has done in the past, including raising the dead, He can do the same and infinitely more for us in our spiritual life, making us more than miracles. While worship anthem “Good Shepherd Of My Soul”, led by keys, eloquently describes Jesus as the good Shepherd, and acoustic guitar led pop number “Jealous” describes Jesus as jealous for us- ultimately letting us know that there are a lot of facets to Jesus, and that’s definitely a good thing! Another quality of our Lord Almighty is that He is invincible, and Becca reiterates this ever true fact with grace and poise in the big booming inspirational anthem “Invincible”, while “Queen Of A Wasteland” is musically quite different to anything Becca has ever recorded. Littered with motifs and similes, it’s tough for me to fully understand what Becca is reiterating here- and hopefully what Becca intended in this track is for the song to be a reminder that while we as people amass more material possessions, we fail to remember that we really are kings and queens of wastelands if it’s not rooted in Jesus. At least that’s what I think the song means. And now back to songs that are more overt in meaning; Becca passionately imparts to us a slower tempo piano ballad “Let My Love”, a horizontal worship song sung between two friends, as a reminder that true friendship is having each other’s backs no matter the result and no matter the cost. “The Sun Will Rise Again”, a piano and strings led slow tempo ballad, is where Becca encourages any one of us struggling in our lives that Jesus is right here beside us and ‘…when all is said and done, hope will rise upon the dawn of a new day, just as quickly as it came, dark will scatter as the morning breaks…’; this hopeful and reflective near-flawless anthem has proclaiming that this song above all is one of Becca’s best of her whole career! “Holy, Holy, Holy” is also featured on Heaven Come Down, and is a brilliant song, as Becca completely re-writes the verses of the all-time famous hymn; and uses the words of the hymn in the chorus, against a musical backdrop of strings, piano and gentle synth. Declaring ‘…be still my heart, rejoice my soul, the Lord our God, has made you whole, lift up your heads, you ancient gates, let freedom flow, come and join a song of praise…’ from the outset, we know that this isn’t any ordinary hymn. In fact, dare I say, that it’s one of my favourite hymns ever, alongside “Amazing Grace (My Chains Are Gone)” and “In Christ Alone”? And that Becca’s version is one of my favourite versions of the song ever, alongside Steven Curtis Chapman’s version from 2005? Need I say anymore about a track that I know for sure will explode and be big over the coming months? Penultimate track “It Is Well”, featuring guest vocals of David Dunn, is another winner here, as Becca reimagines the heartfelt and impacting hymn musically (with an extra added refrain for a bridge! ); and what is described by myself as probably the most enjoyable worship album this year, ends with the gospel infused three minute tune “I Need Jesus”, where Becca admits across gospel choirs that she needs Jesus more than anything. Similar in theme to Natalie Grant’s “More Than Anything”, “I Need Jesus” sums up the album perfectly as Becca fervently recounts that her reliance on the Almighty isn’t like a crutch at all, but rather a realisation of human limitation, and going to the One who is bigger than anything in this world for advice and assistance and our everything. A true moment of raw emotion and worshipful surrender, we are met with a singer so assured that this doesn’t even feel like a debut full length album. Becca Bradley’s debut full length album is like no other this year (granted, we’re only 1 month into the year!). The quality of these heartfelt and honest tracks are just as good as any other signed or unsigned artist releasing their album this year. With Becca having a busy schedule as she forges ahead singing her own music, it’s only a matter of time before Becca is signed by a major record label- maybe within 2-3 years? A great artist to listen to if you are fan of Francesca, or artists like JJ Heller or Leigh Nash; Becca’s music if of immense high quality, with my favourite songs being “Nothing Short Of A Miracle”, “Holy, Holy, Holy” and “I Need Jesus”. Well done Becca for creating honest and inspiring songs which are bound to be loved by critics and listeners alike both now and into the future. Previous PostChris Tomlin– Is He Worthy? (Single)Next PostFLASHBACK FRIDAYS: WEEK 34 (Something To Say by Matthew West)- If we’re living and breathing, is there really something to say?